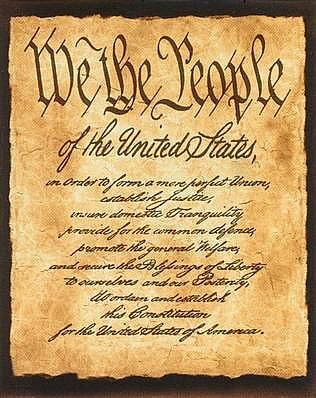 “We the people of the United States, in Order to form a more perfect Union, establish Justice, insure domestic Tranquility, provide for the common defence, promote the general Welfare, and secure the Blessings of Liberty to ourselves and our Posterity, do ordain and establish this Constitution for the United States of America.” ~ Preamble of the United States Constitution, September 15, 1787. No one can convince me that America is not worth fighting for, no one can turn my convictions from my land, from my love. I know God is with me, I know He is in the land that which I dwell, because there is written the proof of His Almighty love, power, and might. I have His sworn oath of duty in my hands, in my heart, and in my life. Because there is this promise in my country I know God is here in the United States of America and in all other nations which prize freedom above all other things. Freedom is upon my lips, freedom is the word that comes forth like a sword of vengeance against all who wish to oppress others, for I have seen God in our Armed Forces, and in our military might. Every citizen has the duty to uphold God and this promise, we all share in the burden to defend our liberty. No one be them male or female has the right to take from the land without swearing and oath to protect that same land which he or she took from. I say to you live in this way, with these promises and your life will be blessed with abundance. Serve with this duty in your heart and this becomes your shield when the fight becomes ugly. Our services members serve with such honor and I solute all those who have fallen in the duty of this great nation. took and serve with responsibility to never take advantage of others who are defenseless and weak. This is the directive every service member serves, and is also what makes our nation so great. We never fail to leave our brethren’s behind, we never fail to answer the call of our allies in need, and we never fail to remember our loved ones and the reason why we serve with such ammunition and vigor. Though our services members serve far from home, it is their humility which raises them up from the plateau of greed, sin, violence, and merciless plunder, and allows our nation to free people from around the world who have called upon our might which is blessed by God. On this veterans day 2012 I want all veterans to celebrate your service, your sacrifice, your will to lead, and your dedication to our great nation and to all people whom we protect from tyranny. May God bless you, your families, and continue to bless the United States of America. Thank you, I’m glade you enjoyed it.